Its official Facebook has killed the fan page tab / app. Well guys is was a great ride but now its over. Facebook has finally driven the last nail in the coffin of the fan page tab / app. A couple of years ago putting tabs on a fan page was a great thing. You could set your fan page so that anyone who visited your fan page would be redirected to a specific tab. You could put a ‘fan gate’ on that tab requiring the user to like the page in order to see the pages content. Even better you could use these gated tabs to run contests, deals and all sorts of other things, giving people an incentive to like your page and become a fan. The first blow to the fan page tab came about 2 years ago when Facebook switched over to the timeline layout and removed the custom landing tab option. This one was a real thorn in the side of app developers. However despite a lot of resistance Facebook made the change permanent. Fortunately page owners found a way around this. While you could not create a custom landing page anymore you could still run Facebook ads that sent people who clicked directly to the apps on your page. A lot of people took this to mean that the free ride was over and Facebook wanted to start making money from fan pages. Most accepted this as reasonable, the ad costs where low, and the benefit of getting fans was worth spending a few dollars a day. The second blow came when people started realizing that most of their fans where not coming back to their fan page. They would visit once, normally by clicking an ad, go through a fan gated app, and afterword only interact with the fan page through the pages posts which would then show in their news feed. Right after this came the edge rank nightmare where people began to see their post engagement plummet. It seemed Facebook was not happy with just getting ad revenue when people built up their fan base, they also wanted the pages to start getting paid ‘(via boosted posts) when fan page owners wanted to interact with their fans. Don’t pay and only around 10-15% of the fans would see your post. This one nearly killed the fan page outright. People hated the fact that Facebook seemed to be ‘double dipping’ and trying to make money not only from building fans but also from interacting with them. Fortunately once again people found a way around this. They realized that by making high quality posts that sparked engagement they could increase their affinity with their fans and ultimately the posts edge rank. Basically they began to understand that by posting quality content that fans wanted to see they could greatly increase the number of their fans that would see the post. The third attack on the fan page tab might have actually been the most minor of all. This one was more of a minor annoyance. You see when Facebook originally moved over to the timeline layout their where ‘tab icons’ underneath the cover photo. Page owners and developers could upload custom graphics for these icons which when clicked would take the user to the tab / app. Well Facebook quietly removed these icons in favor of a timid text drop down menu. As I said though this was a minor thing for two reasons. First: the fans where interacting with the posts and not coming to the pages anyway and second: in practice the only real way people where ending up on a tab app was when they clicked an ad. This did not change at all. Finally came the killer. Well I shouldn’t say it ‘came’ I should say its coming since it does not officially go into effect until November 5th 2014. So what is it? No more fan gating. That’s right you can no longer require a visitor to a tab on your fan page to like the page to continue. What makes this so bad is that getting the like was the entire point. Getting a like was the motivation that sparked thousands of apps, that fueled app builders and company’s like FanpageEngine, Lujure, PageMoto, Tab Engine, that brought contests, deals, sweepstakes and coupons to Facebook. It was the incentive of getting the page like that fueled it all. Well now that’s gone. Because of this Im officially declaring the fan page tab / app dead! So what is Facebooks justification for removing the fan gating from page tabs? They say that they want fans to like a page because they like the page, not because they are giving some incentive to like the page. However I have to disagree with this logic. Think about this. If Im liking page XYZ so I can get a coupon or discount for XYZ’s products or services then its a fairly safe bet that I like XYZ company. After all I want a coupon for their product or service so I must be interested in them. Unfortunately Facebook either did not consider this or does not agree with that thinking. Either way there is really almost no incentive anymore to put a page / tab on your fan page. To the timeline we go! Facebook now allows contests and sweepstakes in a pages timeline and by boosting a post you can get a great number of people to see the post at a low cost. Also while you can no longer require people to like a page to get a incentive (such as a deal or coupon or a chance to win) you can require them to like a post to enter. The only question is if people are going to accept, embrace, and ultimatly take advantage of this shift in how Facebook marketing is done. Let me know when you have a life time offer instead of a monthly offer. If you want updates and new features then you cant expect to pay a single lifetime price. On thing I hear from people all the time is that the ‘vendor’ forgot about a software a year later or they never updated it, add new features etc. Well what do you expect? These things cost time and money. How can anyone stay in business if they have continued costs and only a one time income. Simple they cant. I have custom pages with tabs on the Timeline. I drive traffic to them with dark posts / FB ads for only pennies because I’m keeping visitors on FB and not sending them offsite. Are you saying that the Timeline tabs/custom pages will be discontinued? I don’t use fan gates so that’s not a problem. Driving traffic to page tabs so you can keep people online is not ideal either because tabs dont work on mobile devices. Your much better off creating a landing page as an app and sending traffic to the app since they work on mobile devices. Really as I said there is no benefit to the tabs. There are some apps that create mobile friendly FB Tabs, if you use them you can still take advantage of the Tab. Several do that. However its important to note that the dont actually create mobile friendly tabs, what they do is they create ‘smart links’ that detect if the user is on a mobile device, if he is it will redirect them to a mobile version that is off of Facebook. No app builder can actually create mobile tabs on a fan page, because fanpages just dont have tabs on Facebook mobile (as in the dont exist). Given that these apps just redirect a user off of Facebook for the mobile version anyway it kind of defeats the entire point of keeping people on Facebook. Brett does this mean tab engine/ first social will be retired? I dont own First Social anymore. Tab Engine however will not be retired. I sold lifetime access to Tab Engine and I meant it. I will always keep it online to fulfill that obligation, though honestly its not very useful anymore. Seems unbeliable. I bought the video program from Brian Moran 30th Dec 2011. Less than one month later came the timeline change. Now that Im starting to fall in love with boosting posts and was going to create TABS and a Landing page on facebook.. AGAIN a change.. Does this mean that a restaurant owner will not be able to contact his fanpage customer’s and offer them a special offer like a cheap meal ? You can still have an offer on a fan page tab, like a coupon etc. However you cant fan gate that tab and require people to like the page before they get the discount. Also as I said in the article fan page tabs DONT work on Facebook mobile. So if you want to build a page on Facebook its not ideal to use page tabs. The only real reason to use them was the fan gating functionality, which no longer exists. (well I should say which will no longer exist after Nov. 5th). Now that Facebook has removed the fan gating there is no advantage to sending people to a tab, only the disadvantage of the tabs not working on mobile devices. Although my fan page is new it seems to be working ok.
Shaun, Fan page’s themselves are fine…. Fan page tabs and apps, (what Brett is talking about here), are just a part of a fan page…and they are no longer as useful as they once were, due to Facebook changes. I can recommend pages Squeezematic, and forget tabengine? Sorry for my English I am from Latin america. Tab Engine (which is my own tab building software) does have a mobile URL like most. But the whole point was always to keep the user inside of Facebook. The mobile URL takes them off of Facebook defeating this point. SqueezeMatics embed is much better since it does not make tabs on fan pages, it makes canvas apps, canvas apps work on Facebook mobile so the user never leaves Facebook (which is the desired effect). If one uses the free Thunderpenny Facebook app they provide a mobile friendly link so that when someone visits you tab using that link on a mobile they are shown a mobile version of the tab. This seem fine to me, what problem do you see with this Bret? Yes most tab builders do this. The thing is though if the idea is to keep people inside of Facebook then this goes against the idea since the mobile friendly link is off Facebook, so really it defeats the whole point. I was looking in your reviews to see if you ever did a review of TabFu, it doesn’t appear that you have. If you have the time, I would like very much for you to do a review of TabFu and see what you think. Something that TabFu has that I think is quite interesting, is a link generator for mobile pages to use. Although not perfect, I am not ready yet to say all tabs are dead, as I know there are always more than one way to skin a cat. Granted, they will never be used as before, but I have to believe there are still some possible uses for them. Such as, have you taken a look at TabFu yet? You are most likely not going to like what I have to say, but it appears when you make up your mind nothing else makes any difference. I totally get it that you think using tabs with like gates are dead, and I agree as well, but aren’t there ways to use tabs other than just for like gates? Can’t you make a tab and then direct traffic to it through a link in a post? 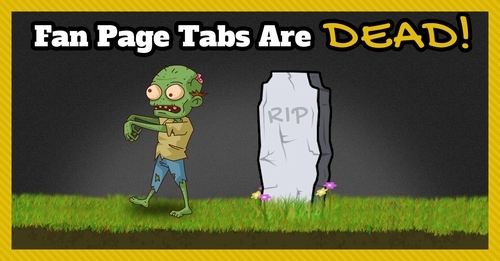 I am not an expert by any means, but are you saying that tabs are dead for any reason what so ever? As I have said to several other people making a tab on a fan page then driving traffic to it via a link in a post also makes NO sense because a tab does not work on Facebook mobile and the only way for a tabs content to show to mobile users is to take them off of Facebook to an external site, which is against the whole point of the app in the first place.. This is why I advocate canvas apps for doing just what you described, since canvas apps DO work on Facebook mobile and does not require taking people off of a mobile site. So we are back to where we started, realizing that there is no reason to use a tab on Facebook. Not in any way to disagree with the main thrust of your analysis – all the more so because I’ma very long way away from being a FB expert – I am intrigued by Tabfu’s offer. It seems from their promo video (http://youtu.be/U_1jUPr8nbo at timecode 03:50) that they’ve found a way to run the tabs natively on mobiles. “All our Templates are fully mobile ready and responsive – whether your Tab is opened on a desktop computer, tablet, mobile phone, in a browser or the dedicated Facebook App itself, Tabfu will recognise the device and display the Tab accordingly! LOL Special Technology. They should say ‘old technology’. People have been having mobile versions of Facebook tabs for years (litterly, my own tab builder, which I refuse to sell anymore had this 2 years ago). What happens is that you need to link people to a ‘smart link’ which then detects if they are on a mobile. If they are it takes them to a website that shows a mobile version of the tab. If they are not it just takes them to Facebook. The #1 reason to do fan page tabs was for the fan gating, which no longer exists. The #2 reason is because people claim Facebook gives a better CPC for ads if you keep people in Facebook. Now I have never seen a single case study on this but lets just assume its true. Well if your using that ‘smart link’ type of tech you have to direct them off Facebook so it does not matter anyway. People have a hard time accepting change. The simple fact is there is no reason at all to use a Facebook tab anymore. Some people will argue that, but they never give a actual reason for their argument. In fact ask the vendors “Why?”, tell them you want a flat out answer “Why use a tab on a fan page”. Ill wager you dont get a direct / solid answer. Because there is none. Brett, I think you’re missing a very important aspect of what TabFu can do. In your response, you seem to insist there are only 2 reasons to do fan page tabs: 1) Like-Gating (which is going away) and 2) keeping visitors on FB. I would argue, however, that neither of these are the most important or useful functions if you have a great offer that you want to go viral. The most important feature to create a deal that goes viral is Share-Gating, where you require the vistor to share the offer on FB before providing the content/offer/whatever it is that you’re trying to promote. This is way more effective that Like-Gating for getting an offer to go viral. TabFu has this functionality… And it works on mobile. So your saying the most important aspect of this software is its ability to let you break Facebooks TOS? I would hardly call that a good thing! The share is not required. The visitor can simply close the share box that pops up. Hence, it is not against Facebook’s TOS. But many will still opt to share… Especially if it’s a great offer. Please make up your mind before you post. This was a great update on Facebook marketing. I have enjoyed your reviews and most importantly your FB marketing products. Can you provide some guidance on the best ways to place apps on the Facebook Fan Page time line to promote local businesses deals or coupons? Though there are not many timeline apps currently since tabs where so often used I do see timeline apps being the future of Facebook marketing apps. I expect that within a few months new ones will start appearing. It finally happened…..you already felt that,right?! thats amazing man.. I just saw this today but is was published back in March, is this the same thing or Facebook changed its mind after this article? Because it says here Tabs stay, but will be hidden. Tabs are not going anywhere, they are just useless now. This information is posted Just-In-Time… I was about to purchase Tab-related FB software.